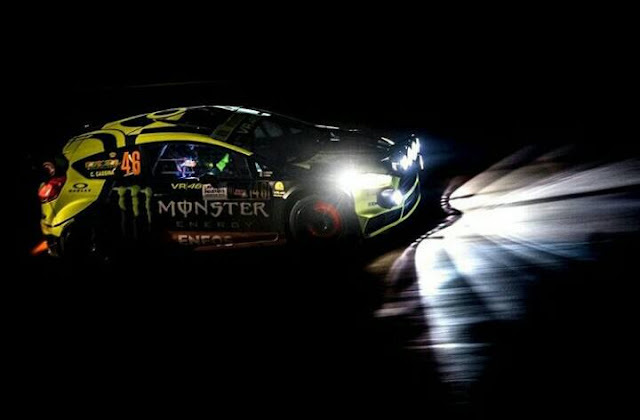 Valentino Rossi jumped to the Monza Rally Show by setting himself up in the special stage 4, the first on the GP distance (45 kilometres). On Saturday there are two other specials, one of which in the long distance. Rossi recovered in one fell swoop the penalty imposed in the PS2, the last of Friday: five seconds for having knocked down a skittle, cost the relegation to fourth place. In the first GP, however, Valentino has rebuilt before 2 "9 the specialist Marco Bonanomi and 4" 2 Antonio Cairoli. They lost ground and record Mikkelsen-Neuville, who paid 6 "5 over the long distance. CLASSIFICATION AFTER 4 TESTS : 1. Rossi-Cassina (Ford Fiesta) in 36'35 "6; 2. Bonanomi-Pirollo (Citroen DS3) at 0 "3; 3. Cairoli-Fappani (Hyundai i20) at 0 "4; 4. Mikkelsen-Neuville (Hyundai i20) to 3 "9; 5. D'Aste-D'Aste (Ford Fiesta) at 36 "0.